This week’s Website of the Week goes to the redesigned site of A White Wedding. A very pro-active client and strong existing brand meant that the entire redesign process took a mere 4 days to complete! As quickly and as painlessly as possible, so as not to waste any time, we worked hard with this loyal client on a new flattering look to stun potential online customers. There are many reasons why a website might go through a redesign and they are all important and worth considering throughout the lifespan of your website. It might be that the design looks dated and needs a moremodern and relevant appearance. Or, it might be because your company or business has changed or evolved its branding in some way and therefore needs its online presence to reflect this. Whatever the reason, with Toolkit Websites and our Redesign Service, your website can evolve with your company and the technology that is available today and even years from now. 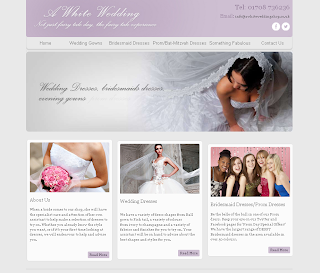 A White Wedding had a very strong idea of what they wanted the site to look like. Using a combination of influences from other admired websites to the colour scheme of the shop’s face itself, we were able to come up with an attractive yet simple design. In this case, the redesign was requested by a new owner of the business who had some new ideas and a fresh outlook on the website as a whole. They took over the project with keen interest and enthusiasm, even writing and placing their own content on pages throughout the build process. The home page makes use of some custom Page Dressing for dramatic effect while the other pages are left to be created by the client who has already demonstrated a great understanding of editing their own website using The Toolkit. This is a perfect example of a client who wants to learn how to use The Toolkit to keep the content of their website as up-to-date as its design. The client also understands how having a grasp of Social Media, and making frequent updates can have a significant impact on how well your website performs in the eyes of the Search Engines. Since the site was finished, the client has also kept the site updated. For example, even stating when there are any last minute changes to the shop’s opening hours. Any and all updates, no matter how small will make a huge difference to how successful your website is and ultimately will provide the maximum traffic for your business. "Thank you for your help and the quick turn around. I will recommend you to anyone I know who needs a website building. It looks really good." This week’s Website of the Week goes to the beautiful and endearing website of Lynne Morgan. Named after the talented dress maker and designer behind the company, this website was built with a clear purpose in mind: to showcase the beautiful dresses that Lynne produces and to strengthen the brand surrounding a business which is obviously more than an occupation to Lynne and very close to her heart. 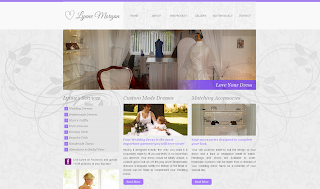 Lynne Morgan is a professional Bridal Wear designer and dressmaker. 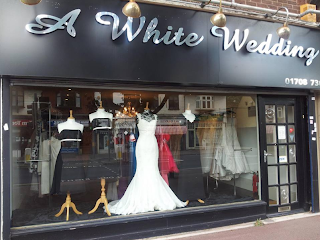 She has over 20 years of experience in dreaming up and creating perfect dresses for her brides from her private studio in Cardiff, South Wales. Her philosophy is to ensure one to one attention with her clients in a relaxed and friendly atmosphere. Ultimately, she wants to make the experience of having a dress designed and made a memorable part of the big day itself. The most astounding thing about this particular website is that the build process took only 13 days to complete! The client was extremely organised and was very helpful throughout, whether it be with providing content, or even just when asking for our opinion and giving feedback on any design choices. This website proves that quality need not be lost when time is a factor regarding a project. Looking at the website, the strength of Lynne Morgan’s branding is in the detail. Everything from the watermarked, delicate background and accented lilac to the integration of Social Media used. The menu bar is a great example of this and is a true feature of the site. It takes up quite a lot of the top portion of the header and initially uses the beautiful background image that is also reminiscent of the script-like text logo. When you go to select a menu item, it then flashes bright lilac – the signature colour of Lynne’s brand and the colour she favours. You will also notice the embedded Facebook Feed on the About Us page. This gives the happy brides and other clients of Lynne a chance to share photos and thoughts from their big days using their own Facebook access which is then automatically updated on the website itself through the feed! It’s a great way to create a fiercely close and loyal customer-base. This is another great example of how this business and website is more than just a profession to our client, Lynne. It’s also worth mentioning the importance of the images on this website. They were all taken and in some cases even drawn by the client herself! For such a personal touch, we thought it was very deserving of the Light Box Gallery effect. If you visit the gallery of the site and click on one of the images, you will see that they pleasantly reveal the image in full and are highlighted by a darkened background. This is a great way to emphasise these wonderful pictures and happy memories. This week’s Redesign of the Week goes to Ashton Dennis Consultancy Recruitment Solutions for their minimalist and modern looking website that also makes use of some fantastic special features. It maintains an overall professional look and feel and uses some key design characteristics and functions to command a strong online presence as a professional business. Ashton Dennis is a specialist recruitment consultancy, dedicated to placing highly skilled candidates into the right roles. Their work ethics are based on honesty and integrity, and they relish the challenges that working with a diverse range of clients can bring. They provide support to their clients every step of the process, from analysing what roles would be best for an individual to briefing them on how to perform in a job interview. They recruit all across various Media, Publishing and other creative industries, so if this is your field, they are the experts to help you. Overall, they provide clients with an exceptional service that sees recruitment goals become a reality and as such, would benefit from a website that reflects their professionalism. The original website was built in 2010 and though the website looked great then, as we all know, style and fashion can become outdated very quickly. This is also the case when it comes to websites but one of the great things about having your website with Toolkit Websites is we can offer you our Redesign Service whenever you feel your website needs a certain refresh and style update. 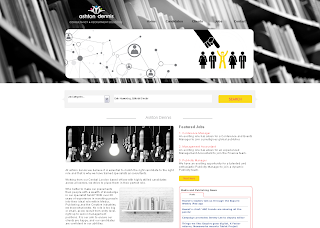 Firstly, a few feature updates have been made to make the website easier for candidates and clients of Ashton Dennis to browse. A minimalistic-looking News Headline box can be found on the Home Page and will automatically update with new articles concerning the world of Media and Publishing. But, most important is the new, customised, and very handy Search Bar that lets users of the website look through various job roles they may be interested in. This is both figuratively and literally the heart and centre of the website. As you will see it is placed in the very middle of each and every web page and has access to all job opportunities for the candidates of Ashton Dennis to browse. One of the main things you will notice about the new Ashton Dennis site is the very modern use of black and white which is consistent across the website. Furthermore, all images make use of softer rounded corners and you will also notice the tasteful use of a key accent colour (yellow) in the header image as well as certain linked buttons. This week’s Website of the Week is Open Road Driver Training for their incredibly informative and feature-rich website. 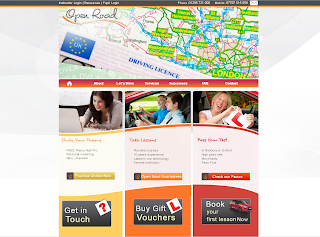 The client has made the most of their online presence through custom forms, practical plug-ins and external links that make it as easy as possible for learner drivers with Open Road to get organised. 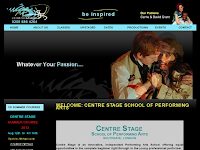 The website covers all areas of access from booking their lessons to practising for their Theory Tests and more. Open Road Driver Training is run by Leigh Bliss, an experienced and trusted driving instructor. Leigh makes learning to drive a great experience for her clients with a great instructor attitude and personal characteristics coupled with effective lesson planning. Overall, Open Road just want their students to experience a safe and comfortable environment while learning the skills needed to become a confident driver. in order to obtain vouchers and half-price lessons! And finally, a Website Feedback Form. As you can see, the website of Open Road Driver Training provides access to everything their students may need in one place. This website is not just a way to attract business but is the heart of the business itself. Anyone looking for a Driving Instructor who comes across this site will immediately be impressed by everything Open Road has made use of. There are many ways you can utilise what other websites have to offer to improve your own website. The Toolkit makes it easy for you to embed any plug-in or widget you desire and increase the functionality of your site. It’s worth looking at what related sites have to offer you. You could include anything from an embedded Twitter or Facebook Feed, a Youtube Video or Google Map to a weather widget for your sailing company or a booking facility for your hairdressing site. The possibilities are endless and are just waiting for you to discover what’s out there.